When the Surface Laptop was released a year ago, it immediately struck me as the Microsoft-built computer I’d been waiting for. You see, I’ve always admired the design of all of Microsoft’s Surface products, but at the same time felt that they weren’t exactly for me. The keyboard cover on the Surface Pro is just too crappy to write blog posts on; the SurfaceBook, while impressively designed with its fancy detachable hinge mechanism, is simply too bulky a machine for me to port around everywhere; and as for the Surface Studio — I don’t even know what the hell I would do with it besides play a very expensive game of touchscreen tic-tac-toe. But lo, the Surface Laptop at a glance seemed downright practical. It’s an attractive laptop in a lightweight package with solid guts and a reasonable price tag. It’s got some of that Surface design flourish without any frills that make the device impractical. After spending a year with the model that now costs £1079 (7th-generation i5, 8GB of RAM, 128GB storage), I’m still mostly enamoured. There’s a lot that makes it a delight to use: A shimmering display, a lovely keyboard, sturdy build quality, and fantastic battery life. It gets 11 hours and 10 minutes when streaming a video at a specified brightness of 200 nits. That makes it one of the longest lasting laptops we’ve tested. Compared to similarly spec’d premium 2-1 machines from Dell and Lenovo, the laptop is very satisfying. Even when those laptops might get you just a little more power for your dollar. That said, the Surface Laptop does have some frustrating shortcomings. When the laptop first launched, it shipped with Microsoft’s “light” Windows 10S operating system that only runs apps downloaded from the Microsoft Store. Microsoft offered free upgrades to regular Windows 10, but I decided to give 10S a shot, just to see if it was possible to get away with using only approved apps. As a computer user, I don’t have super high-powered demands. All I really need is Adobe Photoshop Elements, Spotify, Slack, and a web browser. The first three are available from the Microsoft Store, which is great. What is not great is being forced to use Microsoft Edge. While it’s not as terrible as Internet Explorer was, it doesn’t have the expandability afforded by the vast library of Chrome Extensions and Firefox Add-ons. Moreover, lots of websites just don’t play nice with the browser, so I was forced to abandon the experiment. Since launching last year, Microsoft has pulled back on Windows 10S in favour of something called Windows 10 in S mode, a walled garden mode where you can only use apps from the Windows store, but which you can also turn off for free. Not being charged for the full Windows experience is a good thing, but S Mode’s persistence also implies that Microsoft is not ready to give up on its little walled garden experiment. That’s worth noting because, as the company reportedly gears up to launch some rumoured new devices, possibly even a phone one day, we might see Microsoft push the concept again. With my Surface Laptop running regular Windows now, my only big remaining complaint is that the device does not wear age well at all, physically speaking. 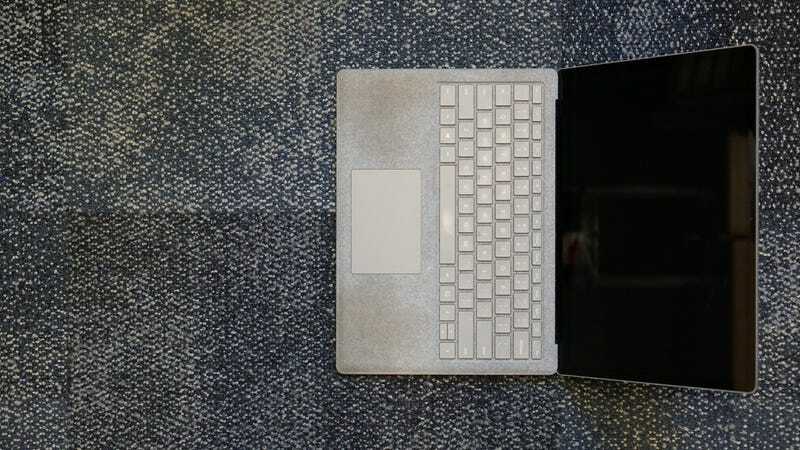 The laptop’s aluminium finish almost never looks totally clean—it’s almost like the company was looking for a worn feel. I don’t totally hate it, but sometimes it looks a little more beat up than it really is. I’m also a little disgusted by what’s become of the cloth (“Alcantara”) keyboard. It’s filthy. And I’m not even that gross of a human. After a year there are big stains where the oils of my hands have gradually discoloured the fabric. 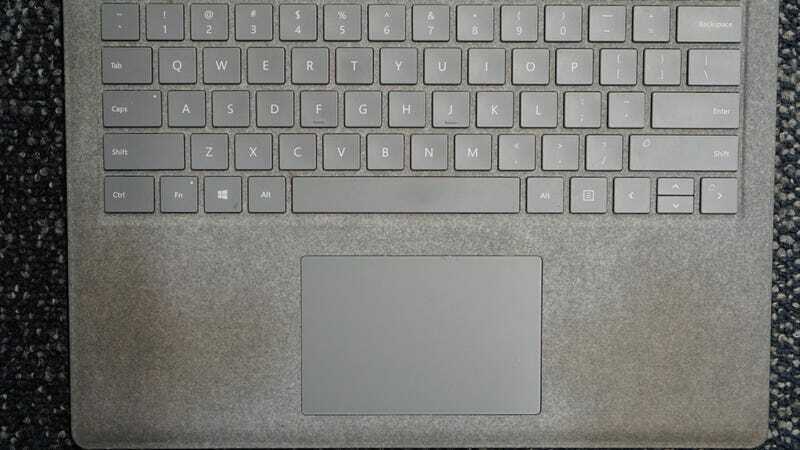 I love that Microsoft has made always bold design choices for its Surface devices, but the cloth keyboard has proven wrong-headed. It makes my otherwise beautiful device feel less than premium. I do have other quibbles: Like our perennial complaint about the use of a proprietary Surface charger rather than USB-C. Though we fully expect the next wave of Surface devices to embrace the future in this regard. If it wasn’t for the Alcantara disgustingness, I would 100-percent buy a Surface Laptop if I needed a new computer tomorrow. It’s almost perfect and a great value for all its perks. But that gross palmrest might leave me looking to another machine. If you can suffer it then go for it, otherwise hope they fix it for the next generation.